The NEC NP-M282X is 2800-lumen DLP portable projector with powerful 20w speaker, USB viewer and ECO Mode™ technology. 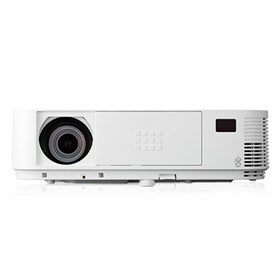 The projector has automatic keystone correction technology, maintenance free design and integrated active lens cover. It features cornerstone, advanced AccuBlend, AutoSense and geometric correction. The NP-M282X also features auto power on, closed captioning and virtual remote. This filter free projector has variable audio out, carbon savings meter and sleep timer. It provides easy wireless communication to enhance portability. The NEC NP-M282X has many exciting features for users of all types. See the NEC NP-M282X gallery images above for more product views. The NEC NP-M282X is sold as a Brand New Unopened Item.